When I started this blog last year, it was intended to document my progress in astrophotography from starting out as a total newbie with no clue about anything. I’ve only been doing astrophotography for a little over year now, and when I started, I knew nothing about photography or Photoshop. I learned everything I know on the subject today through watching video tutorials (YouTube is an amazing resource), trial and error, and comments and advice given by others. It’s been quite an amazing journey of learning, and I doubt it will end any time soon. So far, my blog entries have been about anecdotal chronicle of some of my photo sessions mixed with random informative posts and reviews. 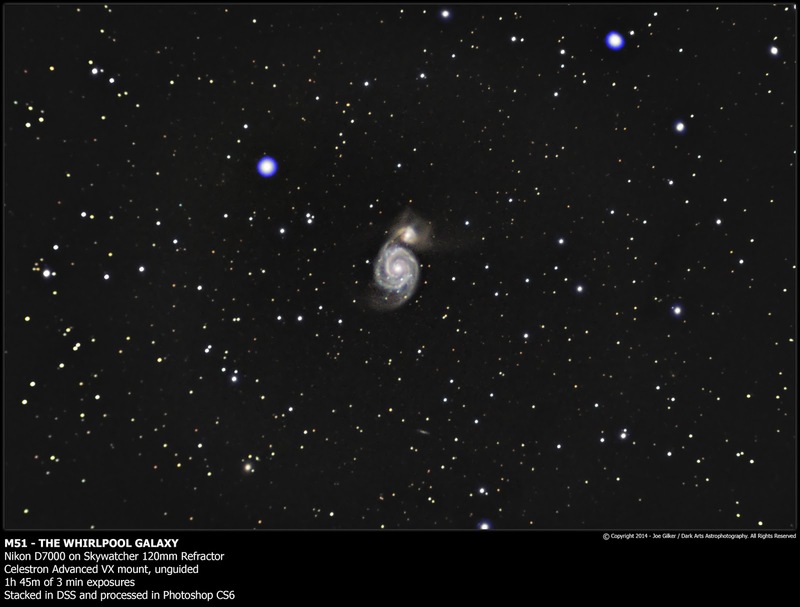 My progress as an astrophotographer can be seen though the work I’ve posted here since I started this blog, but by no means is it really the main focus of the blog as a whole. Today I change that with this post. It was time to analyze my skills and gauge my progress over the past year. But before I get to that, an explanation of how it happened is required. This past weekend, I spent a lot of time on watching a bunch of processing tutorials learning new tools and techniques to add the the basic set I already had been using. 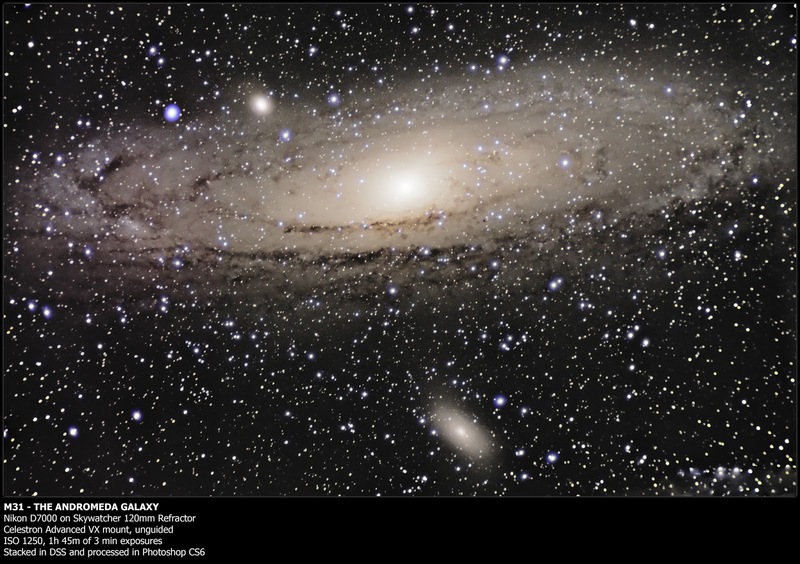 I applied them to some ongoing projects I had (M31 and M51), and my results seemed to be a drastic improvement over previous attempts at this difficult data, as well as my previous images of those same objects. While processing these images, I developed a new workflow using these new tools and techniques I’d learned, documented the process (finally – I can’t stress enough how this part was helpful), and followed this guide to the letter. And the end result was very impressive. Given that, I thought I would go back and revisit some old data to see what I could do with it. To date, my favourite image has been my pic of the Orion and Running Man nebulae I shot last November. So I figured I’d go dig up that data set to see what I could do with it now that I had a better understanding of Photoshop and had new skills under by belt. This is the result of processing my old data with my new and improved workflow. I was able to have a much nicer, neutral brackground vs the pitch black (although it could be a touch darker), and was able to pull much better detail and contrast out of the nebulae. I’m sure I could have even have pulled out more faint detail, but decided I was happy with what I had for the time being. I’ll likely be adding more data to this one M42 is visible in the coming months anyway, so I’ll hold off till then. But for the time being, I’m very pleased with what I’ve accomplished with this new image. That said, I see some processing errors that need to be corrected in the next version. I’m still learning to use some of the new tools I’ve added to my skillset. I’ve just started using manual noise reduction (using Noise Ninja) and using sharpening (never used it before). It’s going to take some practice to be able to come to grips with those processes as well as others I’ve added.In the coming days, I intend to revisit some data I took of M31 last year using only my camera (as with this last image) to see what I can do with this old data and how I can improve it with my new workflow. It should be interesting to see what I can do with it. So overall, I think it’s fair to say that I’ve made great strides in the last year. And I honestly have to thank my friends over at the Amateur Astrophotography Magazine, Astronomy for Fun, and Astrophotography/ Amateur Astronomy Enthusiasts Facebook groups (all linked below). These groups are full of really informative people. I’ve learned a lot from people there directly and indirectly through their informative posts, one on one help, or just seeing other peoples’ work to give me a goal to aspire to. If you’re not a member, you should check them out. And of course, the various YouTube videos, blogs and other posts I’ve read and watched have been invaluable to get me where I am. It’s just mind blowing how much good information there is out there for those willing to seek them it out. In the next while, I’ll try to make another blog post including links to some of the blogs, sites and videos that I found useful, as well as some of the tools I’ve been using. So until next time, friends, clear skies.